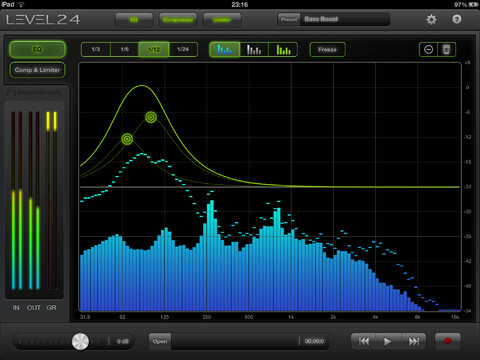 Level.24 is a pro-quality real-time spectrum analyzer, EQ, Compressor and Limiter for the iPad. With up to 1/24 octave band analysis precision and 12 parallel parametric equalizers and ultra low latency, Level.24 redefines audio control on the iPad. Fully Audiobus compatible to receive, process and record sound from other Audiobus apps. Level.24 helps you get perfect sound. In a live sound situation, a (home) studio or an Audiobus configuration, analyze the incoming audio to find peaks and dips and inspect the overall spectral balance. Shape the sound with up to twelve parametric EQ’s, and adjust the output levels with the Compressor/Limiter to add maximum punch.